Radical radiotherapy alone and chemoradiation either in concurrent or induction form with salvage surgery reserved only for the treatment of persisting or recurrent tumor are the main treatment options commonly used. , Decision-making forms a vital factor in planning treatment strategy. In such a situation, it seems judicious and wise to consider organ preservation surgical techniques to improve the quality of life. A retrospective observational study was conducted during the time span of 13 years from January 2000 to December 2012. Data collection was done using the inpatient and outpatient details from the medical records department and departmental records. A total of 28 patients of biopsy-proven cases of squamous cell carcinoma of hypopharynx in Stages I-IV were considered for the study. Out of these, 8 were radio-residual ones. The age range was from 42 to 83 years. Twenty-six were males and 2 females. All the patients after preoperative evaluation with contrast-enhanced computed tomography/magnetic resonance imaging (CT/MRI) scan of neck and thorax along with adequate metastatic workup were treated surgically with laser by the 1 st author. A transoral-micro-endoscopic KTP-532 laser-assisted excision of the primary lesion was done under frozen/paraffin section control. Those with clinically and radiologically positive N status underwent neck dissection in the same sitting or after 10 days. Among all the cases, we had 2 cases in T 1 , 13 in T 2 , 12 in T 3 , and 1 case in T 4 stage. N 0 comprised 15 cases, N 1 had 5 cases, and N 2 had 8 cases. All advanced cases received postoperative radiotherapy except the post radio-residual ones which were managed with surgery alone. Cricopharyngeal myotomy was done in nine cases, where postoperative swallowing difficulties and aspirations were anticipated. Patients were put on nasogastric feeds for 2 days, and oral feeds started from day 3 unless aspiration was significant. Tracheostomy was not done in any case. Patients were followed up for an average period of 15 months. All the patients underwent a video-assisted 70° angled endoscopy of larynx and hypopharynx routinely on an outpatient basis to assess and confirm the nature of growth. A contrast-enhanced CT/MRI from skull base to diaphragm was done mainly to assess the extent of primary growth including detection of submucosal spread to the esophagus, glottis, and paraglottic space and the soft tissues of the neck (carotid sheath) as well as for identifying extensive infiltration of the cricoid along with locoregional metastasis. This knowledge is of utmost importance for the surgical planning of a transoral organ conservative procedure and neck dissection in selected patients. The patient underwent hypopharyngoscopy and biopsy of the growth for histopathological documentation. Adequate metastatic workup of the cases was carried out using high-resolution computed tomography thorax and ultrasound abdomen. Pulmonary function tests were carried out to ensure adequate pulmonary reserve. Written and informed consent was obtained from all patients before the procedure. Necessary safety measures were undertaken during the surgical procedure so as to protect the patient and the operating room personnel from the adverse effects of laser. An adequate size noninflammable laser-friendly tube was used as per the standard guidelines for all cases. Saline-soaked cotton pledgets were placed over the larynx to protect it from thermal damage. The patient's face is wrapped with moistened surgical towels and eyes are covered with sterile aluminum sheets. Protective goggles were used by all theater personnel as a part of safety protocol. Optimum exposure and visualization of the larynx and the hypopharynx is the fundamental step for a safe tumor resection. The primary aim is to completely resect the tumor with negative margins. Preoperative evaluation provides an overall plan of the extent of local spread of tumor and helps in assessing the extent of resection. Tooth guard is used to protect the upper teeth. The Weerda distending operating laryngoscope is introduced and suspended by a chest support. A Mayo's stand is used to rest the elbows. Adequate exposure forms an inevitable component for tumor resection. Once the patient is in the proper position and the lesion identified, the margins of resection are marked with the laser. Once the laser excises through the anterior edge of the resection margin, the grasping forceps are used to lift the lesion off the posterior cervical fascia. En bloc resection of tumors is possible for small early lesions [Figure 1]. In case of larger or extensive lesions, excision is completed in multiple segments until the normal supple tissue is encountered [Figure 2]. This method of resection through the tumor dividing it into multiple segments is unaccepted in open surgery. However, Steiner et al. in the early 1980s put forward his technique of resecting the tumor in hypopharyngeal and glottic cancers in multiple segments which is well accepted now. To avoid postoperative edema and the possible need for a tracheotomy, dexamethasone (10 mg intravenously) was given intraoperatively and repeated 8 th hourly for 1 day. Care was taken to avoid injury to the tongue to prevent postoperative edema. All tumors were resected with 1-1.5 cm margin of normal tissue. Intra- and post-operative antibiotic coverage using amoxicillin-clavulanic acid combination and analgesics were provided. 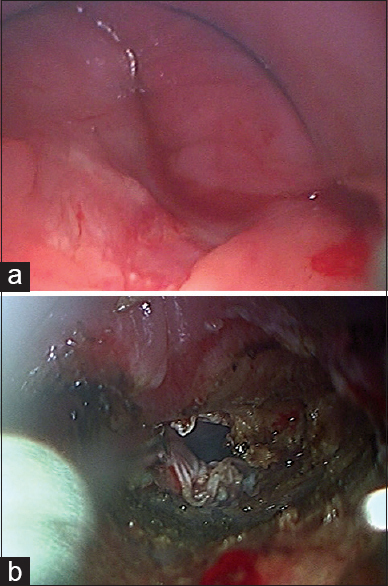 In nine of the cases where extensive mucosal resection of aryepiglottic fold was done, endoscopic cricopharyngeal myotomy was performed in the same sitting with laser to prevent aspiration and facilitate postoperative swallowing. 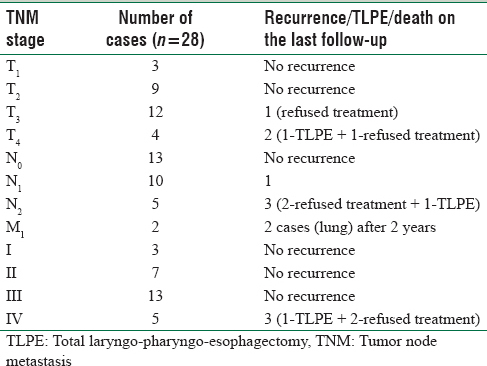 Nineteen patients (N0-8, N1-4, N2-7) underwent a bilateral (60.3%) staged neck dissection within 10 days of the primary resection specially to confirm the negative margins of resection of primary tumor histologically. The majority of the procedures were selective neck dissections with removal of the lymph nodes of the Levels II and III (33.1%), or II, III, and IV (43.1%). Neck node metastases were histopathologically confirmed in 74.8% patients. The selective neck dissection including lymph node Levels IIA, IIB, III, and IV was performed with intraoperative assessment of Level V in each case to ascertain complete removal of metastatic tumor tissue. Modified neck dissection was performed in case of intraoperative suspicion of positive nodes. Twenty (71.4%) patients including three cases of Stage II, nine with Stage III, and remaining eight cases of Stage IV disease underwent postoperative radiotherapy. All patients with Stage III and IV disease received postoperative radiotherapy at a dosage of 60 Grays in multiple fractions for 6 weeks. Indications for adjuvant chemo-radiation included advanced T category of the primary tumor with microscopically involved margins (R1 resection), one or more lymph node metastases, perineural, perivascular invasion, and extracapsular spread. All procedures performed in the study involving human participants were in accordance with the ethical standards of the institutional and/or national research committee and with the 1975 Helsinki Declaration, modified in 2000 and its later amendments or comparable ethical standards. Approval of institutional ethical committee has been obtained for the study. The average follow-up period for patients was fixed at 15 months. Nineteen of the 28 patients were followed up for 2 years or more, and the rest were considered lost to follow-up. The median follow-up period was 27 months (13-45 months). Survival calculations were done by the Kaplan-Meier method. The overall survival time defined as the interval between the date of surgery and the date of the last follow-up was calculated using these values. For the determination of 2-year specific disease-free survival, patients followed up for 2 years were taken into consideration and the survival without disease was calculated. For the determination of the local control rate and locoregional recurrences, intercurrent deaths and those due to second primary tumors were regarded as censored observations while local and locoregional failure, failure from functional reasons were considered as critical observations. Of the 28 patients in the study, 25 had no disease on their last follow-up. This study comprised 2 patients in T1, 13 in T2, 12 in T3, and 1 in T4 stages. Eight patients were radio-residual cases and underwent salvage surgery (T2 - three, T3 - five). Out of the three recurrences, one patient had minimal prevertebral fascia involvement at 19 months and hence staged as T4. He underwent total laryngo-pharyngo-esophagectomy with gastric transposition at a later date and was lost to follow-up. Rest of the two patients with T3 disease who recurred at 22 months and 45 months, respectively, refused any further treatment. No recurrences were noted in Stage T1 and T2. In all, we had 15 patients in N 0 , 5 in N1, and 8 in N 2 group with no neck recurrences. Stage-wise stratification comprised 2 cases in Stage I, 6 cases in Stage II, 11 in Stage III, and 9 in Stage IV. All three recurrences were in Stage IV cases. Two patients had lung metastasis after 3 years [Table 1]. Overall survival rate: 82.14%. 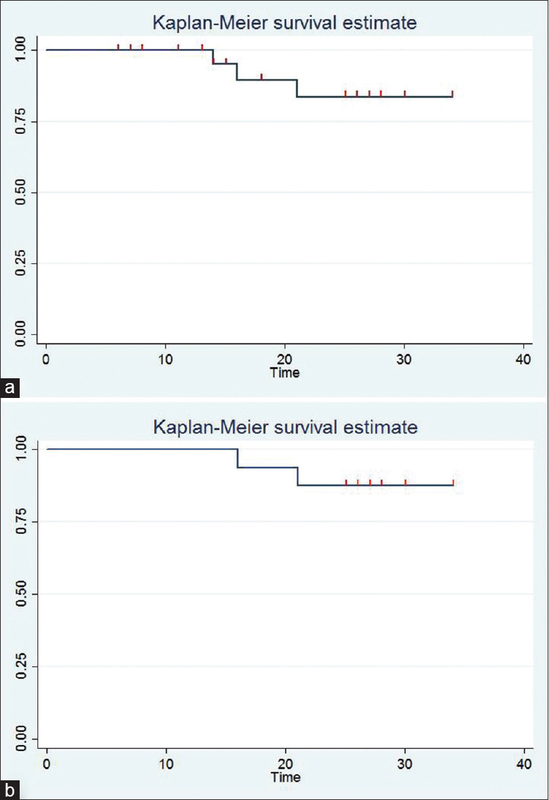 Two-year disease-specific survival rate: 89.4% [Figure 3]a and b. Various studies have been performed with Hoffman et al. calculating the 5-year disease-free survival rate for hypopharyngeal cancers as 63% for Stage I, 58% for Stage II, 42% for Stage III, and 22% for Stage IV hypopharyngeal cancers. The study demonstrated lower survival rates for cases treated with radiotherapy alone compared with surgery with or without adjuvant radiotherapy. Ogura et al. described a larynx-preserving surgical procedure in pyriform sinus cancer. The 3-year survival rate achieved with partial laryngopharyngectomy in highly selected patients with early pyriform sinus cancer (mobile arytenoid cartilage, apex of the sinus, and thyroid cartilage free of tumor) was 59%. Thirty-four percent of the patients lost their voices as a result of a secondary laryngectomy because of local recurrences. Spector et al. report 5-year disease-specific survival rates for conservative surgeries ranged from 46% to 77% depending on location and extension of the tumor. Our results, obtained with transoral laser microsurgery combined with selective neck dissection and postoperative radiotherapy, demonstrate less perioperative morbidity, and complications and no fatal complication. ,, The recurrence-free overall survival rates and 2-year disease-specific survival rates achieved by us were evidently better. In this study, all patients were evaluated meticulously before the surgical intervention followed by neck dissection and/or radiotherapy depending on the case scenario. There was no need for a tracheostomy in any patient and duration of hospitalization was about 3-4 days postsurgery. Five patients had postoperative dysphagia that was managed by performing a laser-assisted cricopharyngeal myotomy (total 9). Aspiration was noted in two patients for a few days postsurgery who were treated conservatively. Patients were advised regular visits to outpatient section every 3 months for clinical assessment of primary and to look for locoregional and distant lesions. Cases are being followed up with repeat chest radiography and ultrasound of neck in cases with clinical suspicion. Despite progress in diagnostic methods, surgical techniques, radiotherapy protocols, and newer chemotherapeutic agents, the prognosis of hypopharyngeal carcinoma has not taken remarkable strides over the last few decades. Significant gray areas are persisting in the approach of these tumors which needs to be tackled. Whatever the treatment approach, the overall survival at 5 years remains modest and rarely exceeds 30%. Deaths from distant metastases, second cancers, and intercurrent diseases represent 30-40% of cases. , Thus, for these patients, it is judicious to consider not only the locoregional control but also the quality of life since larynx preservation is concerned. The results with KTP-532 laser-assisted microsurgical treatment of hypopharyngeal cancer have been found to be superior to conventional strategies with respect to locoregional control and survival rates. Morbidity and rate of complications were lower, the functional outcome was found similar, if not better and the rate of larynx preservation was higher. Awareness regarding the drastic effects of tobacco and alcohol needs to be explained to the patients during each visit. Our results demonstrate a positive view toward survival outcome following organ-preserving laser-assisted microendoscopic surgery. We hope that these results with transoral laser microsurgery for early and advanced stages of hypopharyngeal carcinoma would act as a nidus for budding surgeons and institutions to incorporate this organ- and function-preserving approach into their system. Hall SF, Groome PA, Irish J, O'Sullivan B. The natural history of patients with squamous cell carcinoma of the hypopharynx. Laryngoscope 2008;118:1362-71. Samant S, Kumar P, Wan J, Hanchett C, Vieira F, Murry T, et al. Concomitant radiation therapy and targeted cisplatin chemotherapy for the treatment of advanced pyriform sinus carcinoma: Disease control and preservation of organ function. Head Neck 1999;21:595-601. Prades JM, Schmitt TM, Timoshenko AP, Simon PG, de Cornulier J, Durand M, et al. Concomitant chemoradiotherapy in pyriform sinus carcinoma. Arch Otolaryngol Head Neck Surg 2002;128:384-8. Wahlberg PC, Andersson KE, Biörklund AT, Möller TR. Carcinoma of the hypopharynx: Analysis of incidence and survival in Sweden over a 30-year period. Head Neck 1998;20:714-9. Hoffman HT, Karnell LH, Shah JP, Ariyan S, Brown GS, Fee WE, et al. Hypopharyngeal cancer patient care evaluation. Laryngoscope 1997;107:1005-17. Spector JG, Sessions DG, Emami B, Simpson J, Haughey B, Harvey J, et al. Squamous cell carcinoma of the pyriform sinus: A nonrandomized comparison of therapeutic modalities and long-term results. Laryngoscope 1995;105(4 Pt 1):397-406. Steiner W, Vogt P, Ambrosch P, Kron M. Transoral carbon dioxide laser microsurgery for recurrent glottic carcinoma after radiotherapy. Head Neck 2004;26:477-84. Trotter W. Operations for malignant disease of the pharynx. Br J Surg 1938;16:485-95. Hinerman RW, Amdur RJ, Mendenhall WM, Villaret DB, Robbins KT. Hypopharyngeal carcinoma. Curr Treat Options Oncol 2002;3:41-9. Buckley JG, MacLennan K. Cervical node metastases in laryngeal and hypopharyngeal cancer: A prospective analysis of prevalence and distribution. Head Neck 2000;22:380-5. Koo BS, Lim YC, Lee JS, Kim YH, Kim SH, Choi EC. Management of contralateral N 0 neck in pyriform sinus carcinoma. Laryngoscope 2006;116:1268-72. Panje WR, Scher N, Karnell M. Transoral carbon dioxide laser ablation for cancer, tumors, and other diseases. Arch Otolaryngol Head Neck Surg 1989;115:681-8. Pivot X, Felip E; ESMO Guidelines Working Group. Squamous cell carcinoma of the head and neck: ESMO clinical recommendations for diagnosis, treatment and follow-up. Ann Oncol 2008;19 Suppl 2:ii79-80. Michaski S, Jako GJ, Incze J, String MS, Vaughan CW. Laser surgery in otolaryngology: Interaction of CO2 laser and soft tissue. Am N Y Acad Sci 1976;267:263-94. Byers RM, Wolf PF, Ballantyne AJ. Rationale for elective modified neck dissection. Head Neck Surg 1988;10:160-7. Steiner W, Ambrosch P, Hess CF, Kron M. Organ preservation by transoral laser microsurgery in piriform sinus carcinoma. Otolaryngol Head Neck Surg 2001;124:58-67. Ogura JH, Jurema AA, Watson RK. Partial laryngopharyngectomy and neck dissection for pyriform sinus cancer. Conservation surgery with immediate reconstruction. Laryngoscope 1960;70:1399-417. 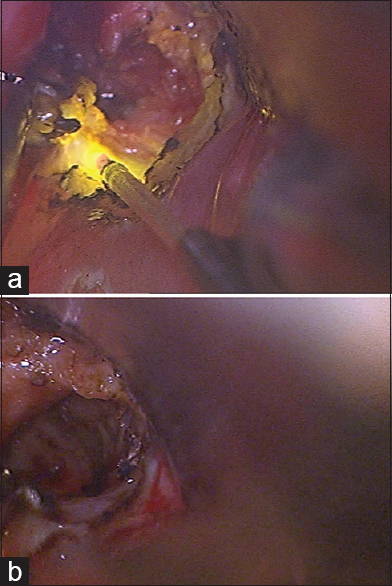 Strong MS. Laser excision of carcinoma of the larynx. Laryngoscope 1975;85:1286-9. Mira E, Benazzo M, Rossi V, Zanoletti E. Efficacy of selective lymph node dissection in clinically negative neck. Otolaryngol Head Neck Surg 2002;127:279-83. Wang CC. Carcinoma of the hypopharynx. In: Wang CC, editor. Radiation Therapy for Head and Neck Neoplasms. New York: John Wiley & Sons, Inc.; 1998. p. 205-20. Cunningham MP, Catlin D. Cancer of the pharyngeal wall. Cancer 1967;20:1859-66. Tuyns AJ, Estève J, Raymond L, Berrino F, Benhamou E, Blanchet F, et al. Cancer of the larynx/hypopharynx, tobacco and alcohol: IARC international case-control study in Turin and Varese (Italy), Zaragoza and Navarra (Spain), Geneva (Switzerland) and Calvados (France). Int J Cancer 1988;41:483-91.